The Virgin Mobile Alcatel Venture Android phone that leaked recently just got fleshed out by the carrier, in all of its $99.99 glory. It's a QWERTY candybar with 3G connectivity and Android 2.3 Gingerbread that comes light on the wallet, since Virgin's plans start from $35 monthly and don't require a contract. Inside the Virgin Mobile Venture is powered by a measly 600MHz processor, coupled with 512MB of RAM. Above the portrait QWERTY physical keyboard is the 2.8" display with 240x320 pixels of resolution, and the phone comes with a 2GB microSD card preinstalled. Well, Google's Eric Schmidt promised at his MWC keynote that entry-level Android phones will break the $100 barrier downwards soon, even in the US, but we didn't know he meant as soon as this week, with the Venture $99.99 handset. The phone is up for pre-order in the source link below, and ship date is pinned for March 15. Looking for Your First Android-Powered Device? WARREN, N.J. (BUSINESS WIRE), March 13, 2012 - Virgin Mobile USA, recently ranked “Highest Ranked Customer Service Performance among Non-Contract Wireless Providers” by J.D. Power and Associates,1 bolstered its lineup of Android-powered smartphones today with the addition of the Venture from ALCATEL ONE TOUCH®. Keeping with the promise of A Higher Calling™, the Venture provides Virgin Mobile consumers with an affordable new smartphone available for $99.99 under the industry-leading plan of unlimited data for $35 a month. A perfect starter device, the Venture –brought to market by Personal Communications Devices (PCD) – is ideal for consumers who want the newest Android technology with a QWERTY keyboard, an entry level price, unlimited data and messaging plans, and all without a contract. It will be available for purchase at www.virginmobileusa.com as of March 15 and at retail following that; visitors to the website can pre-order the phone as of today as well. As Sir Richard Branson states in his video manifesto for A Higher Calling, “Why pay for minutes when it’s unlimited data you really want?” Operating on the Sprint Nationwide Network, Virgin Mobile USA offers tremendous value for those customers who text, IM, post, email, friend, like and tweet more than they talk. Virgin Mobile Beyond Talk plans start at just $35 a month for 300 minutes of voice and include unlimited messaging and data. For those looking for a bit more talk time, the $45 plan offers 1,200 minutes of voice, and the $55 plan offers unlimited voice minutes each month. All plans include unlimited messaging and data. The Venture comes with Android 2.3 [Gingerbread], a 2.8-inch touchscreen and a QWERTY keyboard for the ultimate in texting and email convenience; a 2MP camera with LED flash and video capture; and Bluetooth 3.0. Customers have access to the Android App Market, which includes Virgin Mobile Live, the 24/7 streaming music place to be with live performances and interviews by DJ Abbey Braden and the latest news about Virgin Mobile. Preloaded on the Venture is Mobile ID, a new customizable user interface with The Essentials ID Pack, where customers get the coolest applications hand-picked by Virgin Mobile, in one easy-to-use pack including for social networking such as Facebook®, music apps such as Pandora®, helpful shortcuts, and widgets. Customers can then choose from other ID Packs to personalize their device, including Entertainment, Socially Connected, and Green as well as brands like ESPN and E!. Virgin Mobile USA, one of Sprint's prepaid brands, offers millions of customers control, flexibility and connectivity through Virgin Mobile Beyond Talk™ No Contract plans with unlimited data for mobile phone service, including Android-powered smartphones and prepaid Broadband2Go high-speed Web access on the Nationwide Sprint Network. Virgin Mobile-branded devices are available at more than 40,000 retail stores, including Target, Walmart, Best Buy and RadioShack. Top-Up cards are available at approximately 150,000 locations nationwide and can be used for Broadband2Go services. Experience Virgin Mobile on the Web at Facebook, Twitter, You Tube and purchase Virgin Mobile USA products at www.virginmobileusa.com. It's not ZTE, It's an Alcatel. Looks alright, especially for a prepaid phone. 2.8 inch screen? That's gotta be a record for android. At least i hope so. Even with a keyboard 2.8 inches is tiny, especially for android. The Sprint Express has a 2.6 inch. At least it has a full physical keyboard so its easy to text! 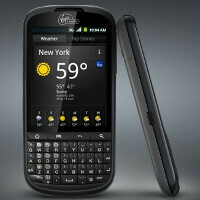 The Tmobile comet has a 2.8inch screen but w/out the physical keyboard. Now that's pathetic! Feel sorry for who ever got that. I would rather they got another Blackberry honestly.